The transition from the Ice Age to the much warmer climate phase that ended it about 15,000 years ago caused a dramatic change in the river systems of southeastern North America. Average annual temperatures suddenly approached those of the present day, and the glaciers that covered Canada began to melt, resulting in the creation of massive glacial lakes along with a rapid rise in sea level. More water could now evaporate and enter the atmosphere. Storm events exceeded what present day inhabitants of earth experience today. During the Ice Age the water table fell and smaller rivers and creeks disappeared from the surface, while larger rivers suffered a lesser discharge and were clogged with sandbars. But when precipitation increased decisively as the glaciers melted, larger rivers swelled and began to meander, and for awhile they meandered to a greater degree than they do today. Geologists refer to these as supermeanders. Smaller rivers and creeks reached the surface again after the water table rose. The Apalachicola River drains the Chipola, Chattahoochee, and Flint Rivers. It was longer and had a larger discharge during the late Pleistocene. In my blog article last week, I mistakenly stated the Aucilla River in Florida didn’t exist until 7,000 years ago, but when I read the scientific literature in preparation for this article, I learned that I was off by about 6,000 years. (I’ve since edited the correction.) The Aucilla River likely existed as a subterranean stream throughout the Ice Age, and it was probably the source for the springs that fed the ponds I discussed last week. It emerged above ground probably about 13,000 years ago. 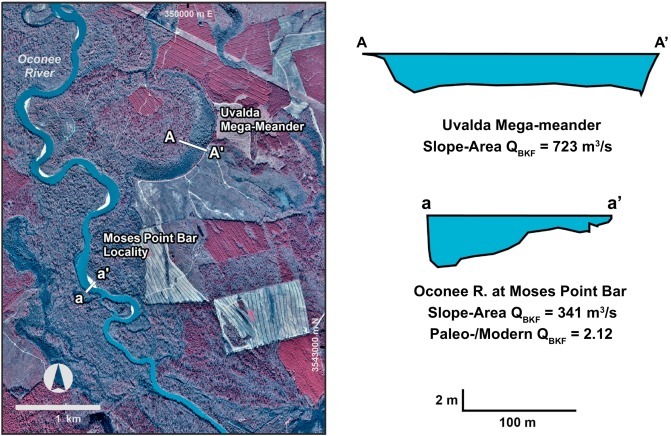 By 11,000 BP the paleo-Aucilla River had a greater discharge than it does today. I wonder if this change was perceptible to the Paleo-Indians who frequented the spring-fed ponds that occurred along the present day course of the Aucilla River. Some time between ~14,000 BP-~13,000 BP increased rainfall enlarged the ponds to the point that a river began flowing between them. This might have occurred within the lifetime of a long-lived Indian. The Apalachicola River is much larger than the Aucilla River, and it too had a greater discharge immediately following the end of the Ice Age. During the late Pleistocene sea level was still much lower than it is today, and the Apalachicola River flowed over the continental shelf for 50-100 miles–territory that is now the Gulf of Mexico but was dry land then. Seismic evidence suggests 1 of the now submerged river channels of the Apalachicola was 300 yards wide and 60 feet deep. The phase of rivers with supermeanders and higher discharges lasted for about 5,000 years before they stabilized to modern day conditions. Side scan sonar image of a submerged river valleys off the coast of Nova Scotia. I couldn’t find a sonar image of the paleochannels off the Florida coast on google images. The Chattahoochee, Chipola, and Flint Rivers join to form the Apalachicola River. They meet near the border between southwestern Georgia and Florida. During the Miocene over 5 million years ago this was the site of an enormous bay known as the Apalachicola embayment. Imagine a bay where 3 major rivers emptied their contents. Eventually, sea level fell and these rivers met and formed the Apalachicola River. An aerial photo of the Apalachicola River as it meanders toward the Gulf of Mexico. The paleo-Apalachicola River was probably clear, not muddy, for most of its existence. Anthropogenic erosion has ruined the pellucid quality of the river.